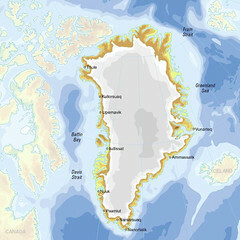 Greenland is located in Northern North America, a large island between the Arctic Ocean and the North Atlantic Ocean, northeast of Canada, comprising 2,166,086 sq km. It has an estimated population of 56,375 (2005) and is managed with self-rule under Denmark. The world's largest island, Greenland is about 81% ice-capped. Major environmental concerns are: protection of the arctic environment; climate change and preservation of the traditional way of life (including whaling and seal hunting).